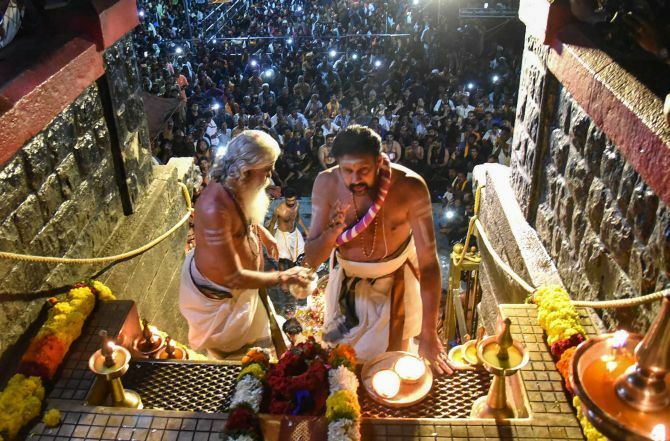 A row broke out on Tuesday over the violation of tradition by an Rashtriya Swayamsevak Sangh leader and a temple board official, who climbed the sacred 18 steps without carrying the customary 'Irumudikettu' (offerings carried by devotees for the deity). Television channels aired visuals of state RSS leader Valsan Thillankeri at the golden 18 steps leading to the sanctum sanctorum sans the 'Irumudikettu'. Responding to the issue, he said he had not violated any customs and claimed that he ascended the 18 steps carrying the sacred offerings. Shortly after K P Sankaradas, member, Travancore Devaswom Board which manages the shrine, said a probe would be conducted, much to his embarrassment, visuals of him climbing the holy steps on Monday surfaced. Sabarimala tantri (head priest), Kandararu Rajeevaru made it clear that only the tantris and members of the erstwhile Pandalam Royal family could climb the steps without 'Irrumudikettu'. As a tense situation prevailed at the temple complex on Tuesday morning when frenzied devotees tried to prevent a 52-year-old woman devotee from offering prayers suspecting that she was of menopausal age, Valsan had appealed to the ayyappas (as the devotees are commonly called) to maintain calm. He also addressed the pilgrims using a microphone. Valsan, who has been camping at the shrine complex since Monday, also cautioned them against alleged 'unruly elements', who could intrude to create trouble at the hill shrine. Slamming the sangh parivar, Kerala Chief Minister Pinarayi Vijayan said its leaders were going to the temple complex without following the customs and traditions. Bharatiya Janata Party-RSS were not interested in maintaining the purity of Sabarimala, he said at Kozhikode. "I am not a person who goes to the temple. Even then, when I visited Sabarimala recently, I went to the sannidhanam without climbing the holy steps as I had not carried the Irumudikettu," he said. Hitting out at the state government, Senior Congress leader Ramesh Chennithala, in a Facebook post alleged that the RSS was 'controlling' the matters at Sabarimala and not police. The RSS leader violated the temple customs by ascending the steps without carrying the customary offerings to the deity, he said. Chennithala also criticised the attack on the woman devotee and media personnel. KPCC president Mullapally Ramachandran alleged that RSS had taken complete hold of the shrine complex. Attacking the Communist Party India-Marxist led Left Democratic Front government, BJP president P S Sreedharan Pillai said pilgrims have been denied the basic facilities like rooms, drinking water and wash rooms at Sabarimala and this was a violation of human rights. He also written to the National Human Rights Commission in this regard.